It’s been a week of hard work in the garden. 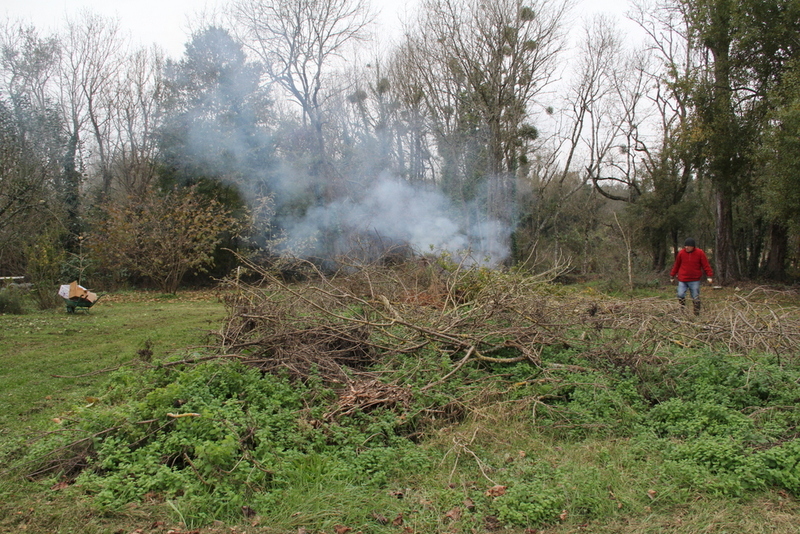 We have at last been able to burn the branches torn down from the trees during the storm on 26 July this year. 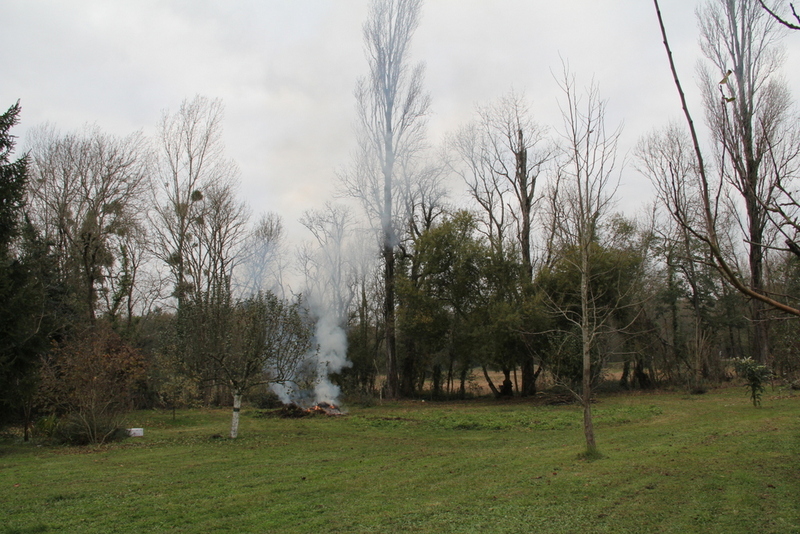 We need to get authorisation from the Mairie (our local authority) to burn the branches in the garden so we were all set for this Friday. 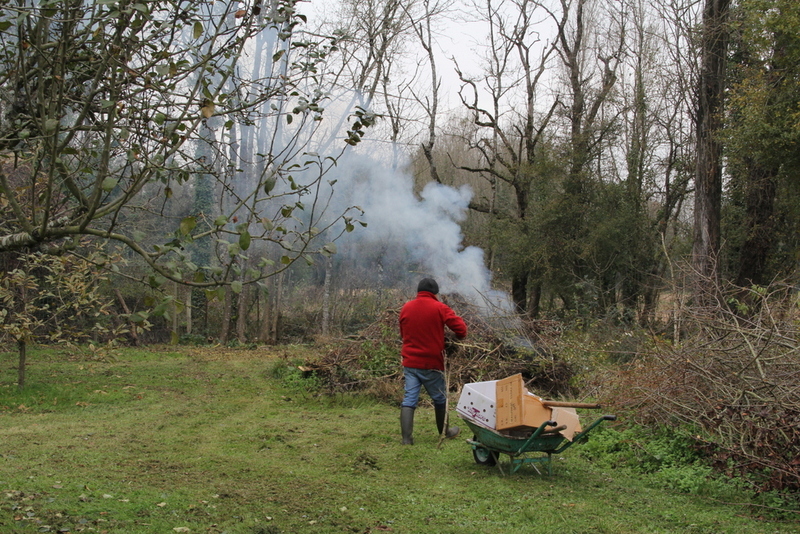 Of course, all the larger wood was cut up and we first brought it up in barrow loads for storing. 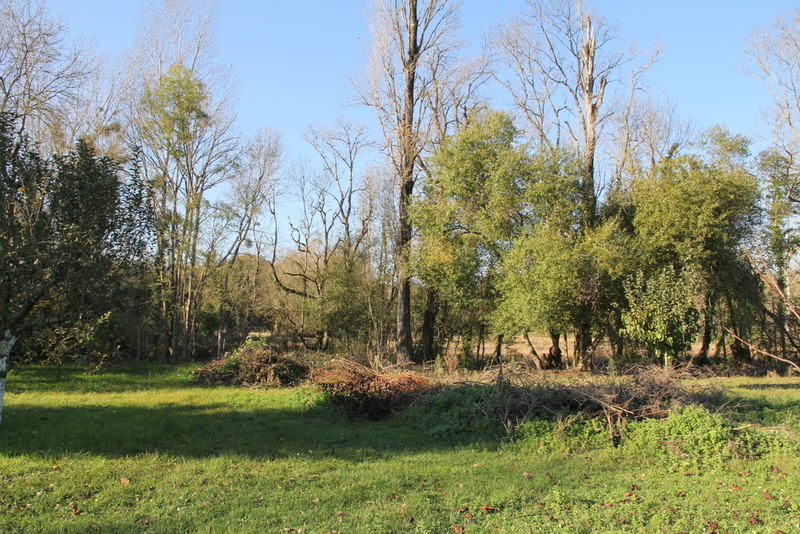 A huge pile of small branches had been left on the grass and even more was distributed under the trees. All it needs now is a cut with the mower and I will be very happy to forget about the mound of branches at the bottom of the garden. I did notice it was the favourite haunt of a wren who used to fly out of it when I passed by. I don’t know if it is the same one that paid us a visit. She came into the utility room. I can’t say I blame her as it was a very cold day. She did no seem in the least perturbed by her visit to the house but I do not know why she was picking up dried leaves to fly off with. It is not nesting time unless they make a place to roost when it is cold. Our resident ring dove is keeping watch over the Kaki fruit as they ripen. 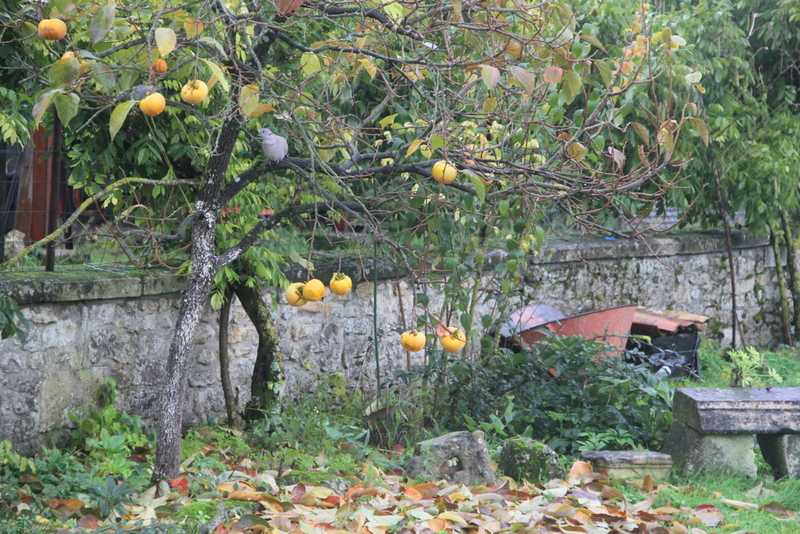 There is not much fruit this year, perhaps due to the late spring. It looks as if it is going to be a race between us and the dove to see who’s going to be the first to get them when they are ripe. 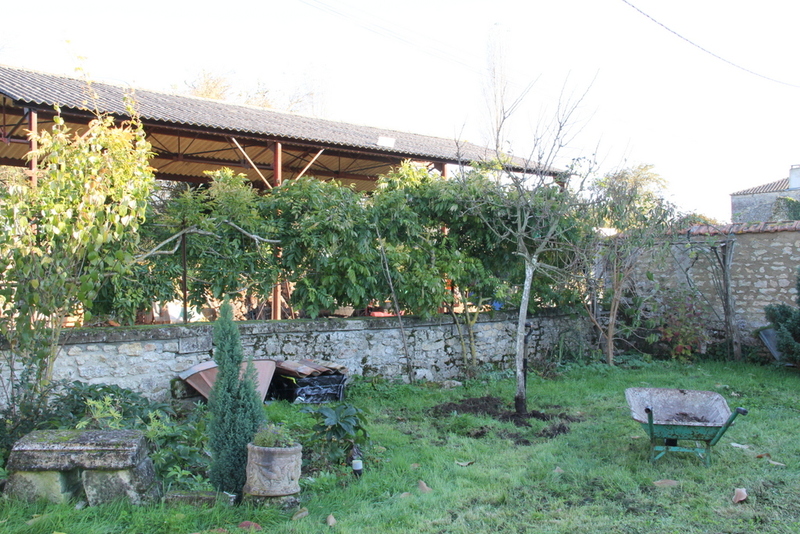 There used to be a Forsythia beside the Kaki tree but this has been removed to allow more sun on the border for flowers. As I cleared the border I lifted a stone from the stump of an old Hibiscus to reveal the little toadstools hidden underneath. I was struck by the symmetry and force of their growth. I noticed another fungus when I was gathering the wood at the bottom of the garden. 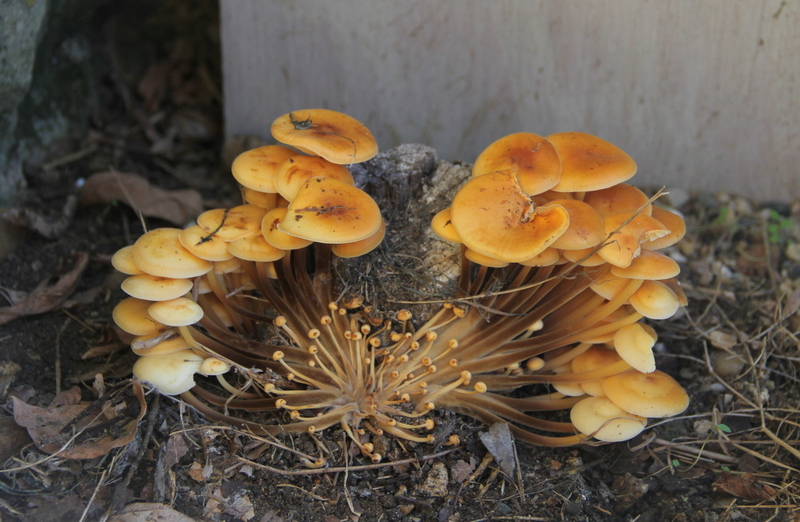 It is an attractively coloured fungus that I have seen before on the dead wood in the garden. 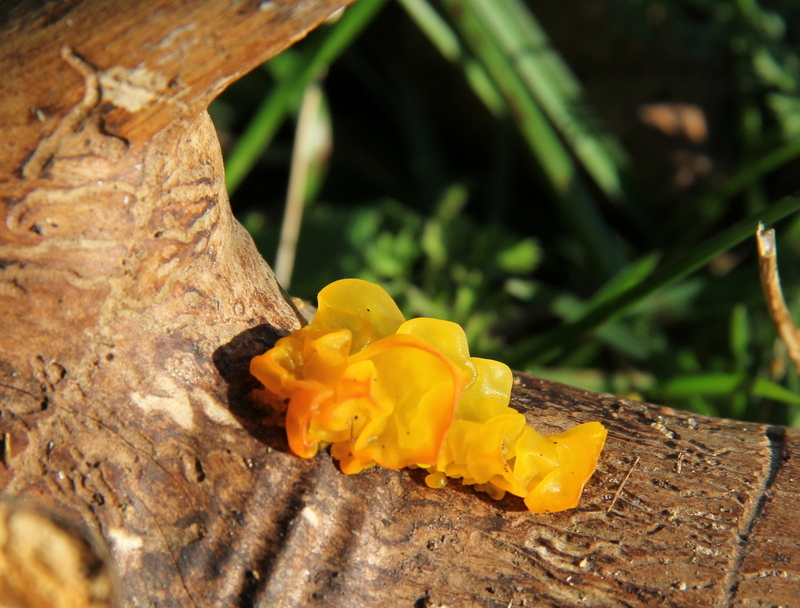 I think it may be Tremella mesenterica. 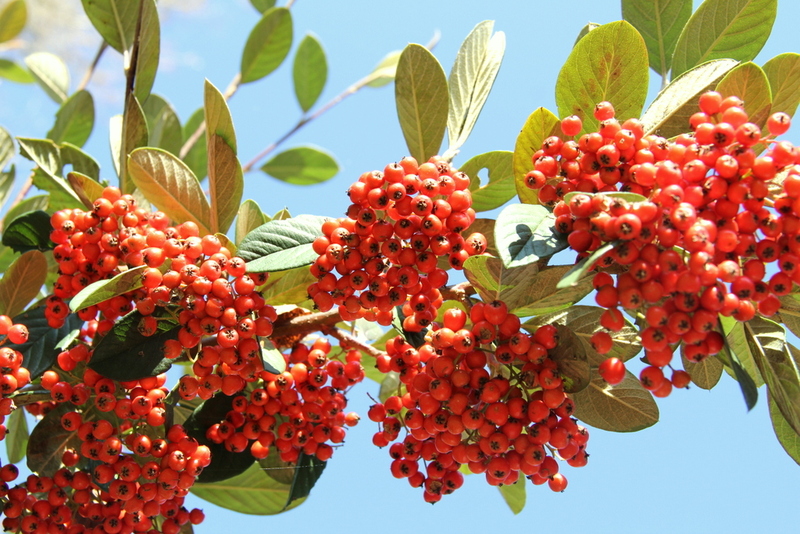 On a brighter note our cotoneasters are full of bright red berries and are doing their bit to brighten up the garden. They seem to thrive here on minimal water and care. 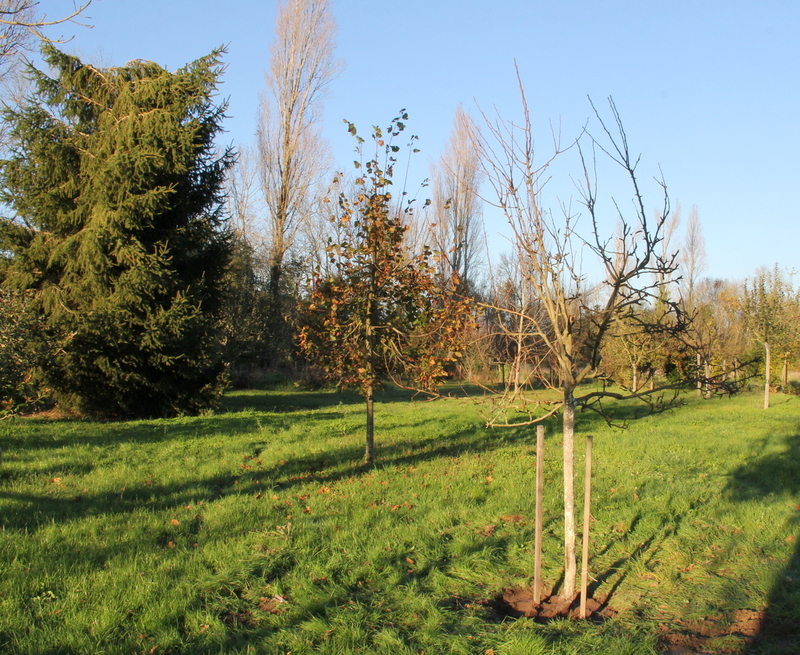 Crazed with our success at replanting our cherry tree last year, we decided to move a pear tree this week. It has not thrived well in the front garden and its removal will give more light to the border behind it. 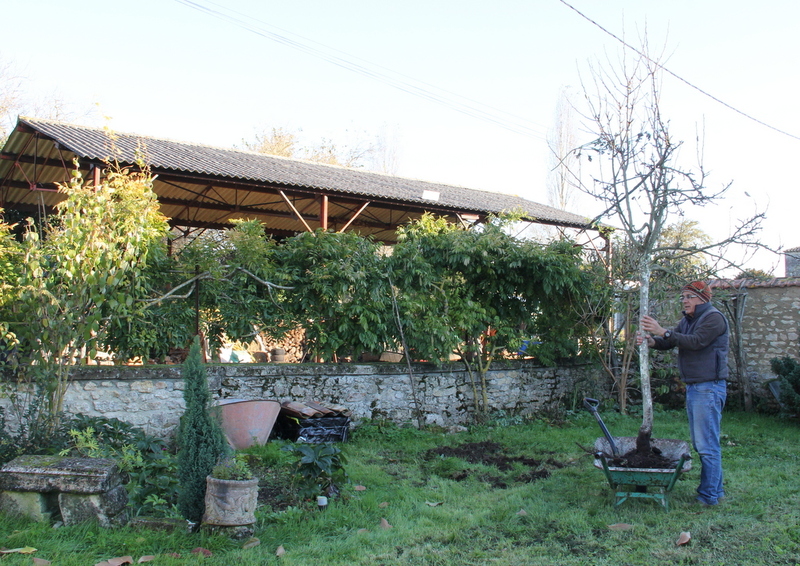 Its roots were not too big and it was a one man job to get it into the barrow. No need to get the car involved this time, which is just as well as it would have been difficult to manoeuvre it into the front garden. It looks much happier in the back garden. 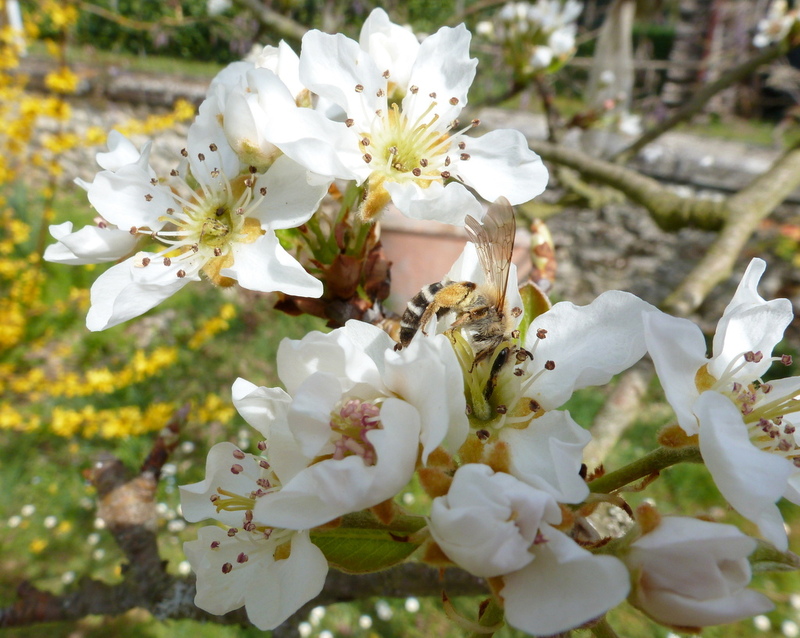 It has not given us large crops of pears (Williams) but I valued it more for the beautiful blossom that it gives us every spring. Gosh! That was a near thing, I nearly posted a blog without a picture of a bee! 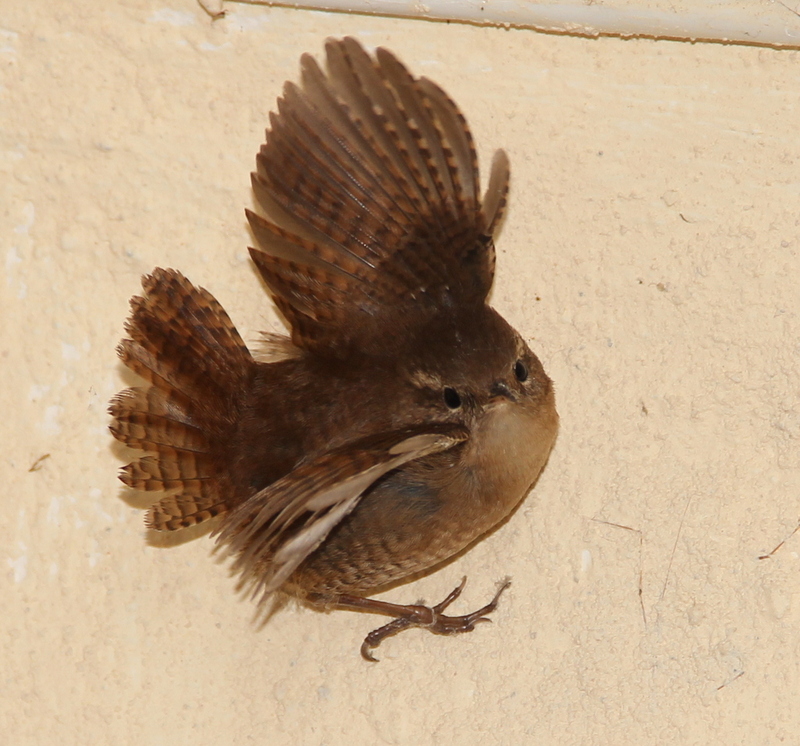 Categories: Garden | Tags: French life, garden, gardening, Troglodyte mignon, wren | Permalink. Last night my husband opened the patio windows at 8 p.m. to clean and upturn the wild birds’ water container so that it would be ready for a re-fill in the morning. He nearly stood on something cowering on the window step. 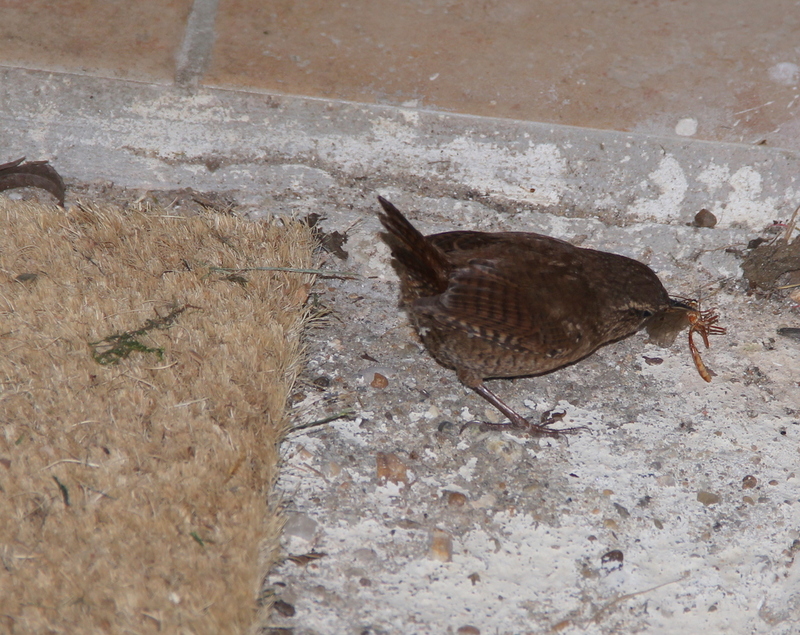 It moved slightly and he thought firstly of a mouse but on further examination it turned out to be a very small bird. Temperatures were under zero and dropping to a forecast -15C. 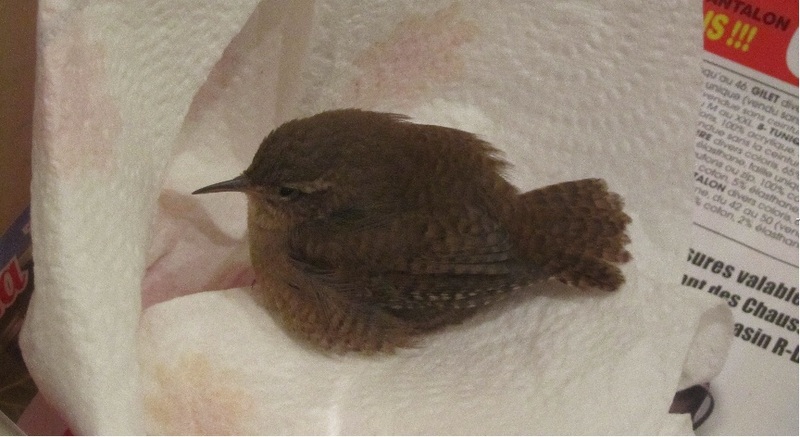 He brought it inside and it appeared to be a very unhappy wren (Troglodytes troglodytes) with no visible injuries. We could not tell if it was weak because of the extreme weather conditions we have been having or if it had hit the window and was concussed. 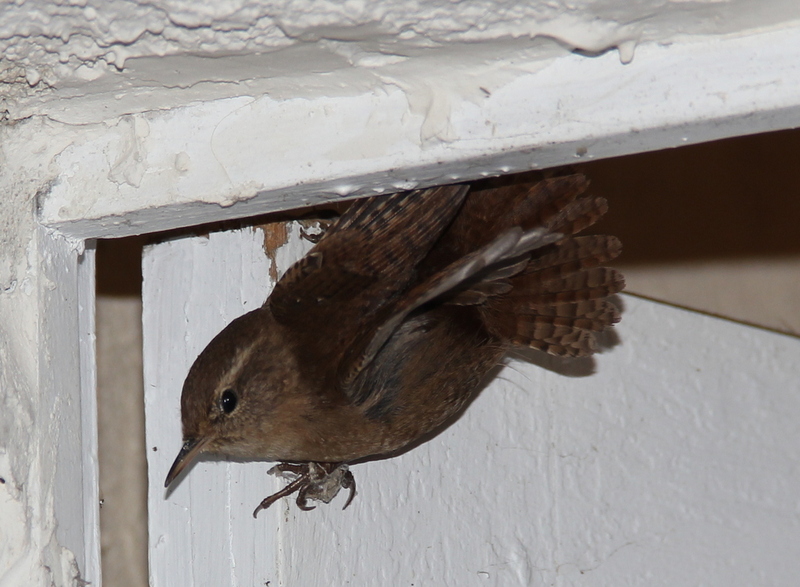 As an aside the wren is called a Troglodyte mignon in France and I can attest that this one was certainly very mignon. In any event we could not leave it to be frozen to death. We are particularly fond of our wrens that live in the undergrowth in the border that separates us from our next door neighbour. They usually stay in the back garden but we have seen them visit our feeding station on the front patio outside our dining room window but only on rare occasions. A rescue box was prepared rapidly. 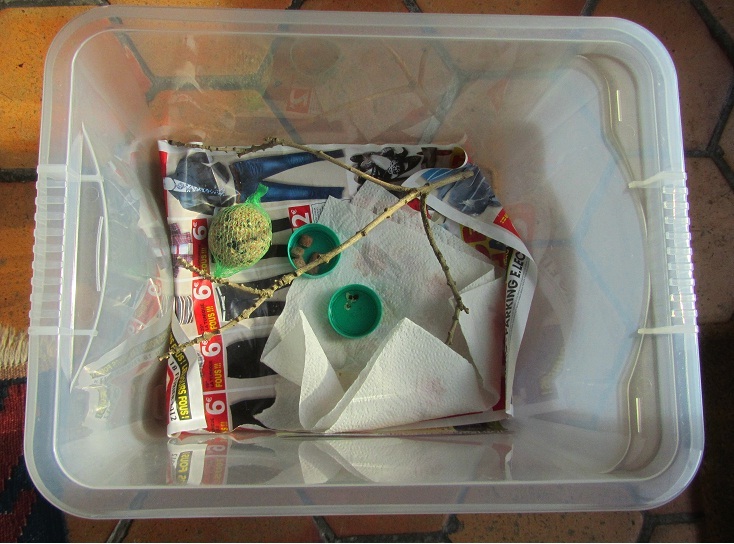 The box is plastic and was lined with newspaper and some softer kitchen paper which could be used as nesting (?) material. I added a little milk bottle top of water and a fat ball. I also soaked some dry puppy food and added that later when it was re-hydrated. We left it alone and heard some movement and taking this as a good sign we put the box in a cool, dark place and hoped for the best. I could not resist a peek later but could see nothing; it was under the kitchen paper and was either dead or asleep as it was not moving. 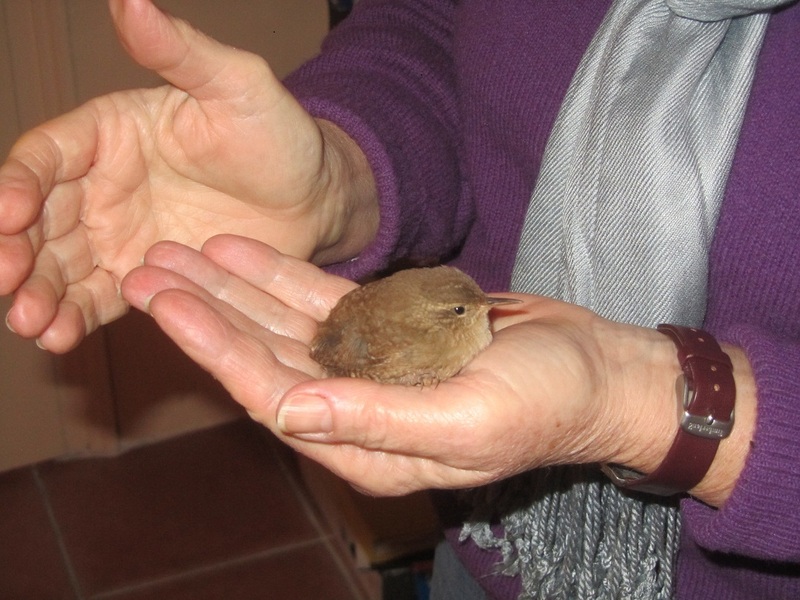 In the morning I jumped out of bed (a rare feat these days) and rushed to check on the wren. It was already up and fluttering. The thermometer read -6C outside but it was light and the other birds were cheeping and flying. The sun was coming up and it was going to be a sunny day so it was time to see if the wren could make it on its own. I lifted the lid and after a few flaps he managed it over the side of the box and made straight for the undergrowth which I had suspected was home to him. I hope he is all right. He certainly has more chance than being left to be frozen to death or be eaten by a rat. I checked the empty box. He had not touched the puppy food which had worked well with the injured woodpecker last year but I could not be sure if he had snacked on the fat ball or not. I suppose a wren’s breakfast would not made great inroads into a fat ball. A happy ending I think! 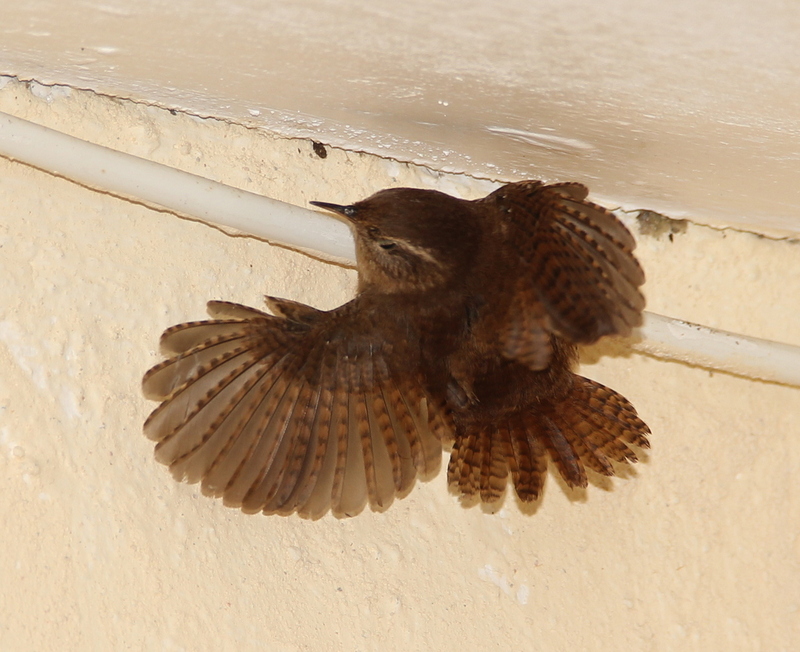 Categories: Birds | Tags: Troglodyte mignon, Troglodytes troglodytes, wren | Permalink.